Major spoilers if you haven’t caught the Sunday, November 30 episode of The Walking Dead. Everyone still here? Alright, read on. In the age of the internet, it’s hard for fans of various shows to avoid TV spoilers. Usually those spoilers come from random news and social media posts, but rarely do they come from the pages of the shows themselves. On Sunday, however, The Walking Dead's social media team made a huge flub, posting a picture with a caption about tonight’s monumental ending, which included the death of a main character. 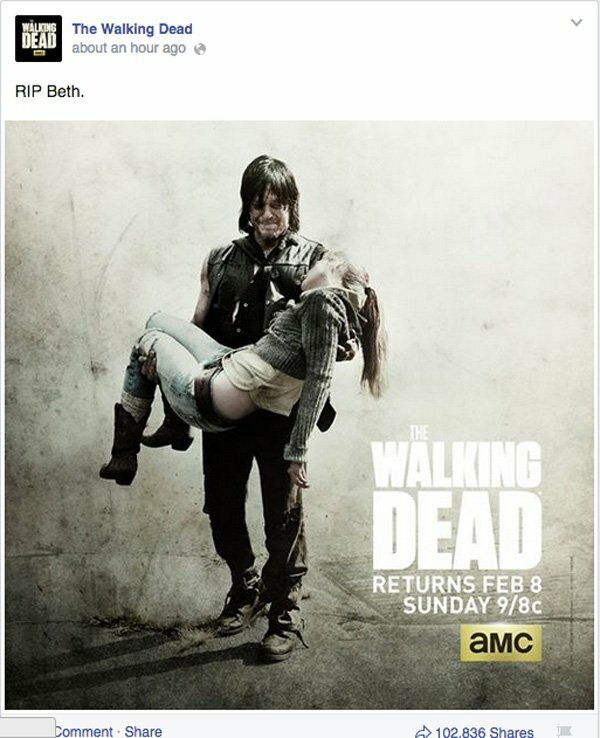 Unfortunately, they posted that picture several hours before The Walking Dead even aired on the West Coast. Talk about a big flub. A lot of people were flummoxed by the situation. Like this guy. Nah, that's cool Walking Dead Facebook page. Don't worry about posting major spoilers before the western U.S. tunes in. Not a big deal. And this fan, who was sad enough that multiple emoticons were used in the post. Whoever runs the Facebook page for The Walking Dead at least pulled the post a little over an hour after it originally went up, instead focusing on posts from the evening that were relatively spoiler-free. There’s one of Daryl and Rick holding up guns, which is the type of imagery we’ve seen from the show over and over again, so no spoilers there! While the person who pushed the post probably didn’t have the West Coast in mind when the Facebook message went up, it’s easy to see why the page desired to highlight moments from tonight’s midseason finale. Fans of the show have been gearing up for this week’s episode all week, and many watchers speculated that something big would happen during the episode (It helped that news outlets with the inside scoop also confirmed it would be an eventful episode). Again, spoilers. What ended up happening was that Beth faced off against Dawn, with the former stabbing the latter while the latter held a gun. It wasn’t exactly a fair fight, but a lot of things about The Walking Dead aren’t exactly fair. And while some predicted Beth might meet her demise this season (our own Nick Venable called it), the moment was still shocking and affecting. Hopefully, The Walking Dead will stay spoiler-free or at least spoiler-lite after the second half of Season 5 starts airing. AMC’s hit drama will return to the schedule in February 2015.